Indulge in all sorts of treasures from the sea this September at the Radisson Hotel Shanghai New World. With a focus on seafood cuisine, the hotel's revolving restaurant lets guests watch their dishes being prepared while enjoying a 360-degree view of the city. The a la carte menu will include clam chowder soup with potato and leek (85 yuan), and tuna tartar with avocado and tamarind sauce (110 yuan) among other treats. From Sept 16 to 26, the Renaissance Yangtze Shanghai Hotel will host its 12th Oktoberfest celebration featuring plenty of German beer and sauerkraut. True to the original festival in Munich, the hotel will erect a large marquee (capable of holding 1,300 people) and will feature a live band from the Bavaria region. Tickets will cost 258 yuan per person from Sunday to Thursday and 288 yuan for Friday and Saturday. They are available in the hotel lobby or online. 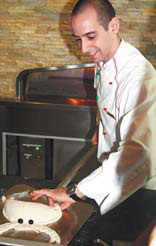 Le Royal Mridien Shanghai's signature Italian restaurant, Favola, welcomes its new master pizza chef Francesco Sanna. Francesco has over 13 years' experience working at top restaurants in Italy as well as at the five-star international hotel's Italian restaurants. In pursuit of a greener world, the Shanghai Hotel is forging ahead with environmentally friendly programs and features expected to significantly lower energy consumption. The hotel has launched various green technologies to reduce its energy consumption such as water-saving systems and solar lighting. The hotel's restaurant also offers a special menu with over 30 kinds of organic food to encourage a healthy diet. The Spa promotion at the Renaissance Shanghai Yuyuan hotel this September and October aims to pamper you with body scrub therapy as a free complement to its signature earth stone massage. 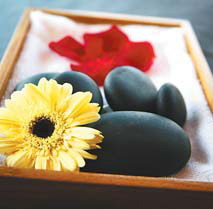 Hot stones stimulate circulation and transport oxygen to tired and tense muscles, while the full body massage leaves you feeling tension free. The spa is open from 10 am to 10 pm.